Every December, as the winter Solstice nears and daylight recedes too early into darkness, I search my garden catalogue for the perfect balm: an amaryllis bulb. I pour over amaryllis flowers in bloom—vivid red, lush white, soft peach, striated cherry. Each one is regal on its tall stem. Each one beckons: choose me. I began the ritual decades ago when my mother was alive, a widow in winter, struggling with children and grandchildren grown, a husband buried. The first time I brought Mom a potted bulb, she was intrigued. Mom listened intently as I explained the importance of bright light and careful watering to bring the plant to bloom. The table by the picture window where she sat to watch the birds at the feeder was perfect. I recall the phone calls, the delight in her voice, as she described the two graceful green points peaking from the soil, their bulging growth, their transformation on stalks into eight perfect blooms. By mid-March, the blooms died off and long arching leaves rose from the base of the stems, lifting Mom through to the end of winter. She and I never did take the step to sink the leafy pot into the spring soil, to let it thrive in the summer months and re-build its bulb. The extra chore, to return in the fall at the exact right time, to lift the bulb, repot, set it into a cool place to rest (but to make certain it did not dry out entirely), seemed too challenging. Since Mom’s death in 1994, I have continued to choose a new amaryllis every December. Coming onto a full year of Trump, I shied away from the very bright reds. They seemed too celebratory, too brilliant for my heart. Drawn to the lime green, there was just the one, I was too close to the sadness of the season. Softness in color, some green, some white, mostly blush, seemed right. 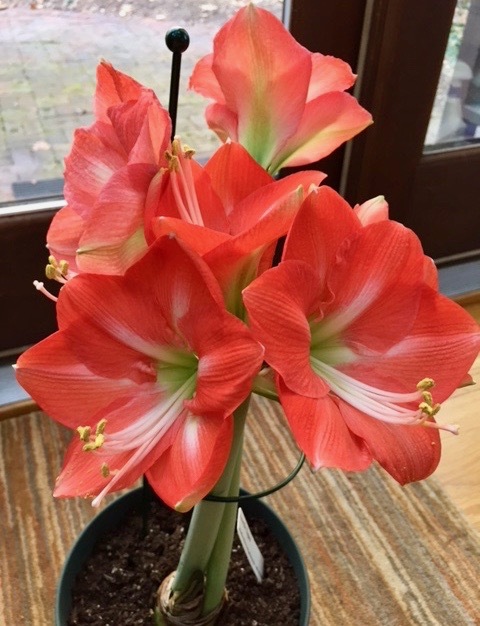 I ordered the Amaryllis Nagano. As I write, the Nagano, now in full bloom, sits on a wide bookcase ledge facing a south picture window. Within days of arriving, I hand mixed moistened soil in a wide vat, packed it into the base of a pot, set the bulb and fanned the roots on top, layering the soil just below the neck of the bulb. Perhaps, it was my anticipation, how much in this fitful, unpredictable political and environmental climate, I needed a sign that growth was possible. In six days, the green tips emerged. Thankfully, I have a little instrument that measures wet and dry and protects me from over watering and causing rot. Like Mom, I feel delight as each bloom opens and reveals its striated color and green throat. Like Mom, I am sad as each blossom fades and dies off. Upon seeing the plant in bloom, a gardening friend asked if I were going to rebuild the bulb. I’m grateful for her question. It seemed apt as the women’s movement grows, the metaphor of embracing and taking on the more complex task of rebuilding and cultivating possibility for sustained growth. This entry was posted in Creativity, Currents, Happiness, Mindfulness, Nature, Politics, Relationship(s), Uncategorized, Well-Being and tagged amaryllis inspires, growth, rebuild, women's movement on January 29, 2018 by fayewriter.